The real God speaks in the plain, exact words of His messengers through the person, life, and death of Jesus Christ. He challenges the world, arousing it from its captivity, demanding that it recognize the truth and be converted. The otherness of that conversion is stressed by the fact that the celebration of God’s mystery does not take place just anywhere: neither in the spaciousness of na­ture, nor in the intimacy of a home, but in the unique, clearly circumscribed area of the church. Thus we find the constantly repeated procedure: the believer goes to the house of God, crosses the threshold, and enters the sacred room within. This is an important part of genuine piety. He remains present, listens, speaks, acts, serves. There is also a special order established within the sacred interior. It is essential to the Liturgy that the important acts of which it is composed are not left to chance or to the momentary spiritual situation, but are arranged and specified with the greatest care. The Lord’s memorial sacrifice cannot take place anywhere in the church, but only at one particular spot: the altar. 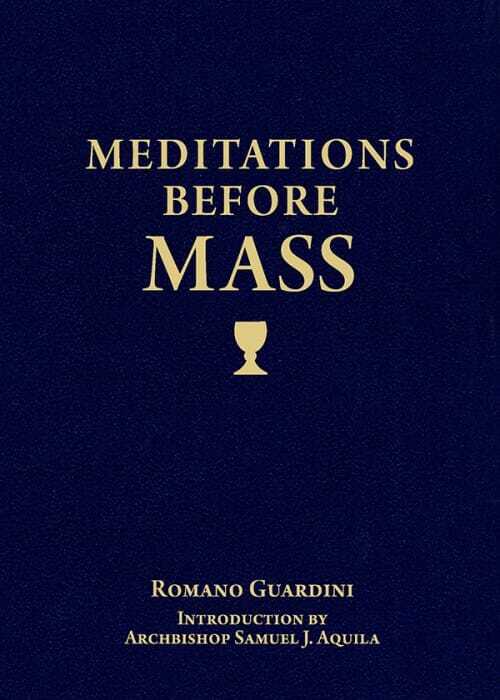 This article is from Meditations Before Mass. Click image to preview or order. The altar is a great mystery. Its religious archetype is to be found in almost all faiths; indeed, I doubt that it is fundamentally absent from any. It appears in the Old Testament. In the catacombs we find it in its earliest form. What then is the altar? Its meaning is probably most clearly suggested by two images: it is threshold and it is table. Threshold is door, and it has a double significance: border and crossing over. It indicates where one thing ends and another begins. The border that marks the end of the old makes possible entry into the new. As a threshold, the altar creates first of all the border between the realm of the world and the realm of God. The altar reminds us of the remoteness in which He lives beyond the altar, as we might say (meaning “divine distance”) or above the altar (meaning “divine loftiness”), both of which are to be understood of course not spatially, but spiritually. They mean that God is the Intangible One, far removed from all approaching, from all grasping; that He is the all-powerful Majestic One immeasurably exalted above earthly things and earthly striving. Such breadth and height are founded not on measure, but on God’s essence: His holiness, to which man of himself has no access. On the other hand, this is not to be understood merely spiritually, or rather, merely intellectually. In the Liturgy everything is symbolic. But symbol is more than a corporal form representing something incorporeal. Let us take, for example, a representation of justice: a woman, blindfolded and holding scales in her hands. The meaning of such a statue is not apparent. First one must be instructed that the bandaged eyes mean that a judge is no respecter of persons; and the scales mean that to each is to be measured out his exact due. This is allegory, whose meaning is not directly perceived. The Liturgy also contains allegories, but its basic forms are symbols. Their meaning is actually hidden, yet it reveals itself in a particular thing or person, much as the human soul, itself invisible, becomes perceptible, approachable in the expression and movements of a face. So it is in the church. The altar is not an allegory, but a symbol. The thoughtful believer does not have to be taught that it is a border, that above it stretch inaccessible heights and beyond it the reaches of divine remoteness; somehow he is aware of this. To grasp the mystery all that is necessary on the part of the believer is intrinsic readiness and calm reflection; then his heart will respond with reverence. It is essential for every one of us to experience at some time or another the fear of the Lord, to be repelled by Him from the sacred place, as Moses was at the burning bush (Exod. 3:2-5), that we may know with all our being that God is God and we are but man. Trust in God, nearness to Him, and security in Him remain thin and feeble when personal knowledge of God’s exclusive majesty and awful sanctity do not counterbalance them. We do well to pray God for this experience, and the place where it is most likely to be granted us is before His altar. Threshold is not, however, only borderline; it is also crossing over. One can step over it into the adjacent room or, standing on it, receive Him who comes from the other side. It is something that unites, a place of contact and encounter. This too is contained in the symbol of the altar. The essence of revelation is the news that God loves us. God’s love is not simply the love we find also in ourselves, infinitely intensified. Inconceivable mystery, it had to be revealed: an unheard-of act that we can begin to fathom only when it is clear to us who God is and who we are. Its real expression is to be found in the tremendous event of the Incarnation, when God abandoned His sacred reserve, came to us, became one of us, sharing with us human life and human destiny. Now He is with us, “on our side.” Such is His love, and it creates a nearness that man alone never could have conceived. All this is expressed by the altar. It reminds us that God turns to us; from His heights He steps down to us; from His remoteness He approaches us. The altar is the sign of God’s presence among us, in us. The same altar also suggests that there is a way leading us — remote, iso­lated creatures that we are — back to our Creator; from the depths of our sin up to His holiness; that we can fol­low it — to be sure, not on our own strength, but on that which His grace supplies. We can cross the border only because God crossed it to come to us. His descent draws us upward. He Himself, the One-Who-Has-Come, is “the way, and the truth, and the life” (John 14:6). Threshold really lies everywhere in the simple fact that God is Creator and man creature; and this fact is heightened by man’s sinfulness, which makes him unable to stand before the Holy God. Yet God has stooped to us in an act of saving love and laid out for us the road to Himself. Thus everywhere we are confronted by sacred barriers repelling us, but also by the possibility of their opening for us. What we call prayer is the mysterious process of that opening. Editor’s note: This article is from a chapter in Meditations Before Mass, which is available from Sophia Institute Press.